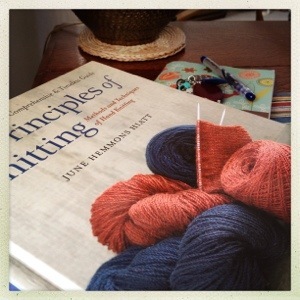 The Principles of Knitting is one big book. Big. I find myself wanting to read it from time to time — hauling it into my lap, browsing a chapter or two. It’s not bed-time reading, because a knitter could end up with a broken nose if she fell asleep with this huge book propped up in front of her face. The other day I needed some information on casting off. I know a number of different ways to do it, but I wanted to see if there was one that would suit my needs a little better. The book devotes a whole chapter to casting off, and describes at least 25 different techniques. Down the rabbit-hole I went. I’m also interested in playing with short rows. Where do I start? With the section on short rows in the chapter called “Shaping a Fabric.” I love reading about short rows, don’t you? Well, don’t you? This isn’t an endorsement, or a book review. June Hemmons Hiatt’s The Principles of Knitting is well known to most knitters. I got my copy when the updated edition was published last year, long after the original had been out of print for so long that I doubted I’d ever see one. But now that I have it, now that it takes up all that room on the shelf, I feel like I’m in command of the craft of knitting. Is there a book that empowers you to be a better knitter?